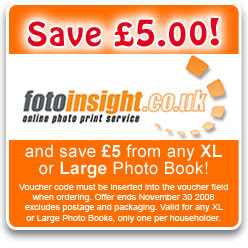 The online photo printing service, founded in 2003 offers its customers a £5 discount on its A4 and new XL photo books. Cambridge, GB. 26 Nov 2007. – During the first four years thousands of digital camera users have had photo calendars printed with FotoInsight. With the popularity of its photo book service, launched in 2005, the online service started to grow rapidly, so that the company is now operating Europe wide. To celebrate it’s success in its fifth year, FotoInsight is giving away £5 discount vouchers on its large (12”x8”) and XL format photo books (12”x12”). FotoInsight’s Managing Director Klaas Brumann comments: "We think that our large and XL photo books are the most impressive coffee table photo books from own digital images in the UK. FotoInsight is preparing to accept photo book orders for delivery within the UK in time for Christmas up to the 10th of December. For Soft- and Linen Cover photo books FotoInsight states that it will deliver in time for Christmas if ordered by the 12th of December." Photo books are a personal present, preserving memories for friends, family and one self. Popular for photographs of memorable events like holidays, a party or wedding photo album, an XL or A4 photo book from FotoInsight will keep the images accessible and preserve colourful memories. In a photo book colours still shine when a SIM-card or CD has long oxidized or become incompatible. Dr. Rolf Hollander, CEO of FotoInsight’s production partner and largest photo finisher in Europe: "Quality is our priority. All materials we use are subject to extensive testing and are guaranteed by their manufacturers to last at least 100 years. This guarantee extends to photo printing on real photographic paper as well as to the photo book." FotoInsight Ltd was founded in 2003 in Cambridge and runs an easy to use digital photo processing service, offering an extensive array of award-winning photographic print and photo gift items as well as the photobooks, photo poster, photographic calendar and photo canvas printing. Customers benefit from patented development processes and the experience of Europe’s largest independent photo lab with an installed capacity of 18 million prints per day. Photos ordered through FotoInsight are processed in one of 20 strategically located, state of the art photo labs, employing 3000 staff, with an output of over 3 billion prints per year. Keywords: Large photo book, XL-format, free, create photo book from own digital images, discount, coffee table style photo book album, voucher, photographic gift items, digital photo album printing, new products, photo print, promotion, FotoInsight. The new version of the Printing-1 photo book software provides new layouts and calendar templates. The demanding photographer or designer on Windows or Apple PCs can now create professionally printed photo book calendars. Photo books are the creative gift option this Season. More and more often, when the camera or mobile phone cam shutter snaps, images do not get printed. Instead, photo enthusiasts create digital photo albums to get them professionally printed and bound. To display the best snaps around the year, Printing-1 offers now calendar templates in its photo book editing software. Photo Books are a popular present for friends and family because they combine style, quality and personal expression in each individual and unique book. With the new photo book calendars the online service is entering the also very popular gift category of personalised calendars, with the quality and platform independence (i.e. the photo book software runs on PC as well as on Apple Mac) associated with Printing-1. It’s Management is preparing for a rush of photo book and calendar orders in the coming days and states that orders placed by the 6th of December can still be delivered in the UK and Ireland in time for Christmas. Printing-1 offers with the photobook software upgrade v3.5 tools to create colour schemes, which can be saved as templates. In addition the number of layout templates has been expanded. Images can be positioned quickly and precisely using templates and can be repositioned freely for a scrapbook design style. Frames can be defined individually for each image but images can also be spread frameless over single or double pages. The Printing-1 range includes five sizes, starting with small photo booklets (Pocket: (H10.5 cm x W14.8 cm), over A4 size books to the 12”x12” Maxi format photo book, all now also as photo calendars. Printing-1 uses a particularly strong binding process for the hardcover books or linen hardcover, soft cover or spiral and can therefore offer larger books with more pages than other photo book services. Hardcover photo books start with 36 pages and can include up to 144 pages with soft or hardcover. The Printing-1 photo covers come in a choice of colours and can be edited with photographs and text. According to Printing-1 during the software development special emphasis was laid on flexibility and user comfort. Images can be scaled and positioned freely. The page numbering style can be turned on or off for each individual page. Instead of a limiting automatic layout assistant the application provides templates to position images precisely and easily. Printing-1 also offers silk matt and glossy paper and its software allows switching between different types of binding and book formats at any time during the design process. 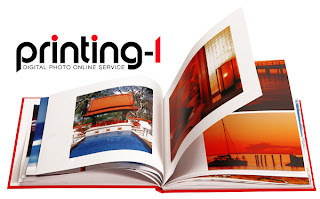 Individual photo books can be saved and shared online at http://printing-1.co.uk as projects. Before placing a print order, the photo book layout file is uploaded to Printing-1 first. There the ditial photo album can be shared free of charge with friends and family before ordering prints. That is particularly practical when after a party or family event others want to pay for their own copy. Sending a printed photo albums directly to friends and family abroad (Europe or the USA) also makes a very personal gift and saves on postage costs. The digital photo service Printing-1 delivers in the UK and most European countries as well as the USA within two weeks of ordering online. Photo books professionally printed from own digital photographs are on their way to replace the traditional photo album. Printing-1 offers a Windows and MacOS compatible online photo service, which can be used with photos from any digital camera or camera phone. Printing-1 specialises in photo books and photo canvas printing only. The professional printing processes allow Printing-1 to offer its photo booklet in the “pocket” format with ring- or laminated binding from £7.95 – plus p&p £4.90 (orders over £100 ship free). Apart from the Pocket and the Maxi format, Printing-1 is offering three further intermediate sizes. Printing-1 started in October 2006 in Cambridge as a British-German joint-venture. The Internet-Service is specialising in high quality, modern photo print products like photo books and photo canvas printing. Keywords: photo book calendars, printed photo albums, book from own digital images, new products, photo book test, photographic gift items, photo printing, Printing-1. "Have you ever stopped to wonder how much recruitment fees are costing your organisation?" asks IBEX's founder David Wood and continues: "For larger corporates this can be hundreds of thousands of pounds; and for the SME marketplace several thousands of pounds per year!" Whichever way you look at it, recruitment fees are generally a lot of money and impact heavily on the bottom line! IBEX Logic is an innovative recruitment process. The client’s vacancy is discussed at length with an IBEX Consultant, so that he or she has a thorough understanding of the requirements. That vacancy is then worked on by IBEX for 2 weeks (14 days). During that 2 week period, a short-list of candidates is provided to the client for them to make direct contact with the candidates. David Wood added: "In general, candidates prefer to speak directly to the potential employer, and not go through the recruitment agent. And we believe that the client also prefers this direct approach!" The cost for this is £450 (plus VAT); and if IBEX does not provide any suitable candidates, the client gets their money back! Simple! The goal of IBEX Logic is to provide quality candidates at a reasonable cost. “Repeat business and word of mouth recommendations are key to our success, and it is this that ensures we continue to provide high quality candidates to our clients!” says David Wood. More information is available online at http://www.ibexresources.co.uk. IBEX Resources Limited was founded in September 2007 by David Wood, an experienced recruitment consultant and former head of PEM Recruitment LLP. Over the last eight years David has focused on technology industry sectors across software, IT Security, Engineering, Electronics, Telecoms and New Media. IBEX Resources is based near the City of Cambridge, England and predominantly deals with vacancies in technology throughout the United Kingdom. A professionally printed calendar with own digital images must rank among the most convenient personalised gift ideas among for friends and family. A UK photo service is expanding this idea with a greater choice of calendars. FotoInsight is growing and the size of its photo print products seems to grow with the company. Posters, canvas printing and the photo book XL format are now followed by a new, larger photo calendar format. The largest photographic calendar is exclusive to the FotoInsight Pro software; the use of an offline ordering software client became necessary to ensure a safe upload of larger images to the lab. With the FotoInsight Pro photo calendar and photo book software comes a range of editing tools, which internet browser could not handle. Editing the calendar through a special software tool allows for example to freely position any number of images on a single page. This is useful when a event should be enhanced by scanned holiday memories, like entrance tickets, postcards or maps – these can now be integrated into a professionally printed photo calendar. The increase in design flexibility follows requests from customers, ordering personalised photo calendars year after year for friends and family. The number of photos taken has been increasing sharply, with the share of those being printed dropping constantly. With the technological advancements in screens and photo-sharing the user prints special images for special occasions; quality expectations towards print products and photo gifts are on the rise. Photo calendar print from digital images is ‘the fashion’. A photographic calendar ordered through the online service FotoInsight, gets printed on the latest generation of Indigo printing equipment. In this process so called ElectroInk, with particles 1µm to 2µm small, is applied. The reduced particle size of the toner creates a higher perceived resolution of the printed image, cleaner edges and finer, finer, more adherent layers than traditional printing methods.